I’m trying to ignore the fact the weather is awful, the nights are dark and January is historically a month I eat my weight in chocolate & I have been forcing myself to be more positive, active and have regular pamper sessions. 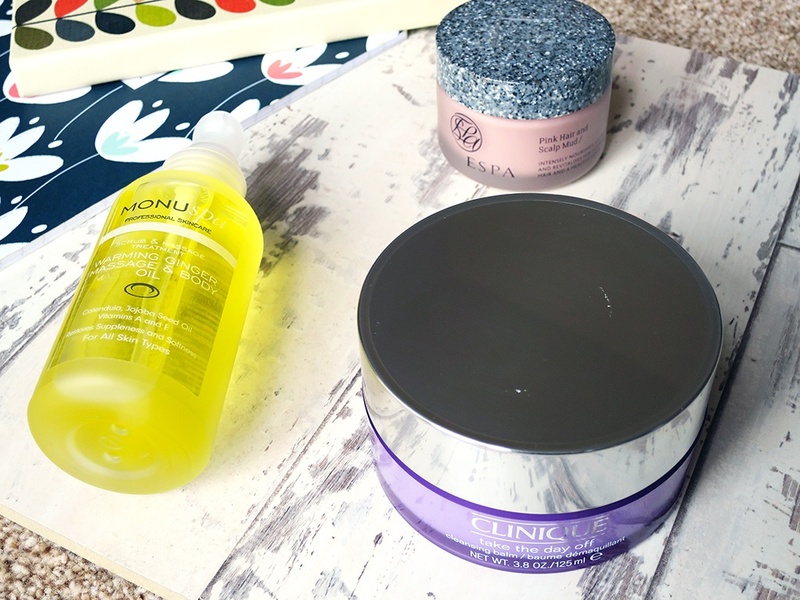 I always neglect my body in the winter months and this year I didn’t want it to be that way so these three products have been regular features of my Sunday night pamper sessions for the past 6 weeks and I love them so much! An uplifting mixture of aromatic Ginger, Lemongrass and Orange essential oils is sure to awaken the senses and provide an energising kick to tired muscles. Added active ingredients such as Calendula, Jojoba Seed Oil and Vitamins A and E deliver all you need to gently restore natural softness to the skin. Taking the day off is what I like to do every evening, cleanse off all the dirt and makeup at the end of a busy day. I don’t just save this for the weekend but it still feels like a treat because it’s so gentle on my skin and it really does take off every stitch of makeup. I scoop a little product out and massage it into my skin for a good few minutes (the balm turns into an oil), taking the time to work the product in and help it dissolve my makeup. Then with a damp face cloth I wipe it all off – my makeup comes off very easily no vigorous rubbing needed, it even removes my mascara. I like that its designed to be nourishing and beneficial for not only your hair but also your scalp too, it leaves my hair smelling lovely whilst feeling so soft and glossy. Its a treat for sure and I love using it when I am having a pamper evening. All ESPA products come beautifully packaged, they make the whole experience luxurious from the scent of the product to the luxurious packaging. You really feel like you’re having an at home Spa experience.